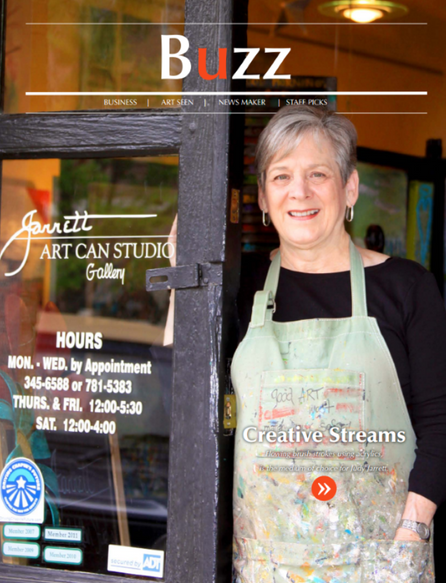 Judy is pictured above in the Art Seen section of the Columbia Living magazine. The photo was taken by photographer Sally Taylor of Natural Images Photography. Step inside Judy's art gallery to see an eclectic collection of pictures, furniture, decor, and prints. Her vibrant canvases are sure to catch your eye and become treasured family heirlooms. Judy works in several mediums such as water colors, acrylics, and now collages - many of them with moving parts. Please visit the Photo Gallery for a sampling of her work. Judy specializes in one-of-a-kind artwork, both originals and prints, and hand painted furnishings, cards, and accessories. Her store is full of unique paintings and great gift items that you won't find anywhere else!